Before I traveled to Vietnam, I had high hopes about traveling responsibly in Vietnam. My aim was not only to produce as little waste as possible (avoiding plastics especially) but also to make responsible travel choices. I chose local tour operators rather than big tour companies and planned to do very little souvenir shopping. 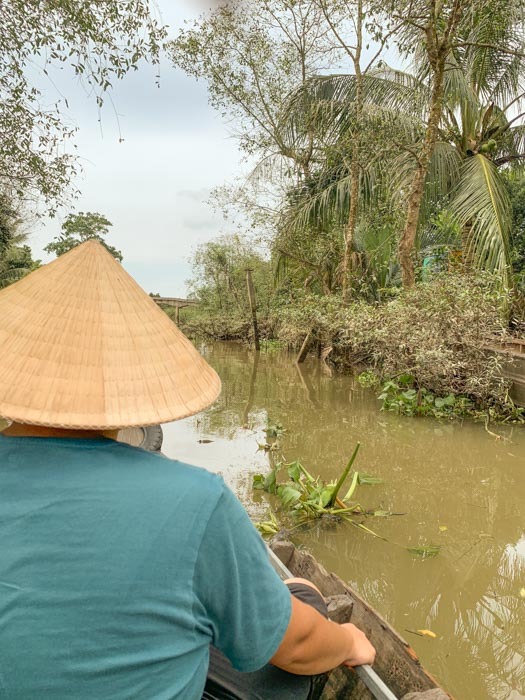 Since this was my first trip attempting to make responsible travel decisions, I wanted to share my tips for responsible travel in Vietnam. Side note: If you want to hear my thoughts about this trip, make sure you check out my blog post here. How to choose socially responsible Vietnam tour operators to reduce over-tourism and help the local economy. So if you’d like to travel to Vietnam responsibly, please read on! Picking tours in Vietnam can be confusing. When it comes to booking tours or experiences, try to avoid booking through your hotel or hostel, unless they suggest a tour operator you trust or have done research on. One word – commissions!! Booking through locally run tour companies means your money is more likely to go towards local families. As an extension of this, locals who run tours are less likely to willingly damage the environment they rely upon to make a living. This is not 100% always the case but often makes a difference. 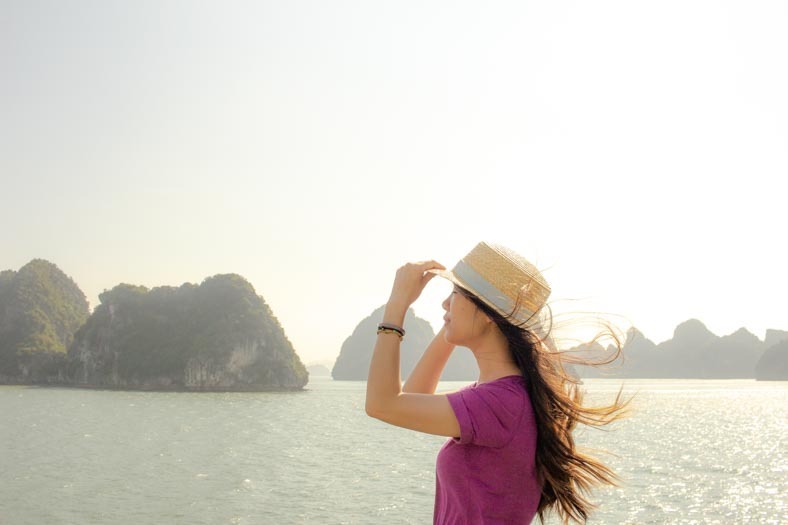 Halong Bay is one of the most popular tourist destinations in Vietnam. Unfortunately, the area suffers from massive over tourism, with over 6 million tourists who visit per year. When visiting, we did a tour with a company called Indochina Junk, who run tours in Bai Tu Long Bay. 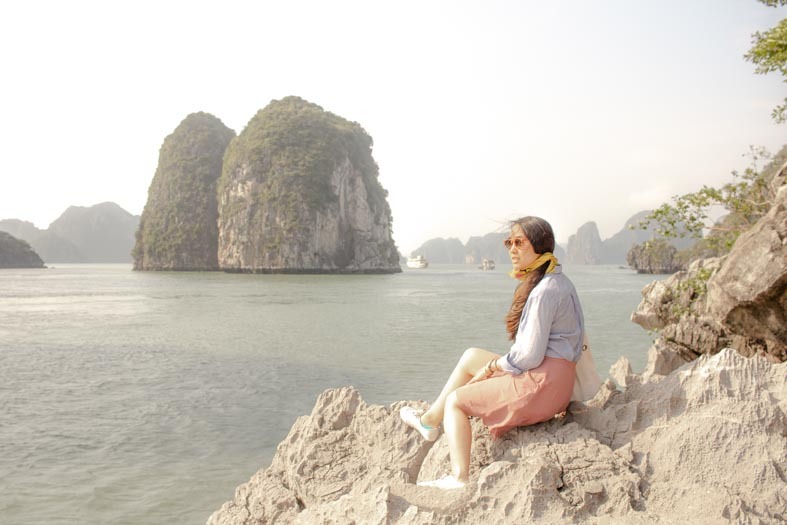 You can read about my experiences visiting Bai Tu Long Bay here! 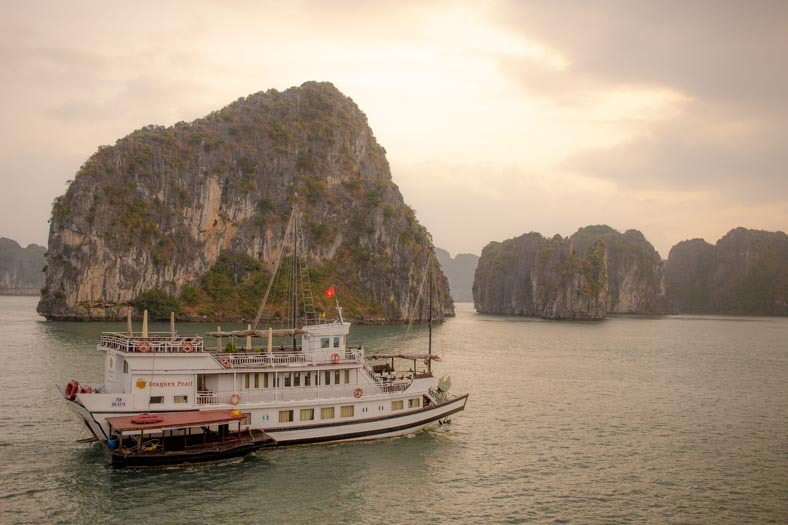 My main suggestion for visiting Ha Long Bay is to make sure to do your research! 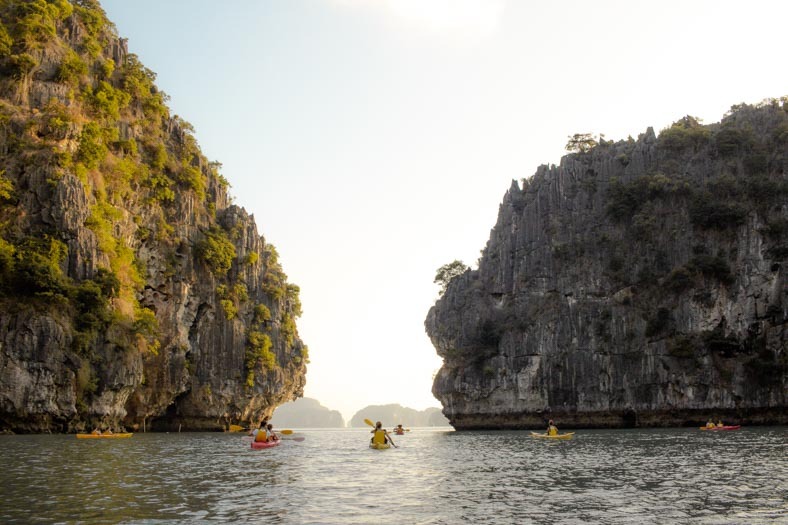 There are a handful of companies which are focused on ensuring Ha Long Bay is around for future generations to enjoy. 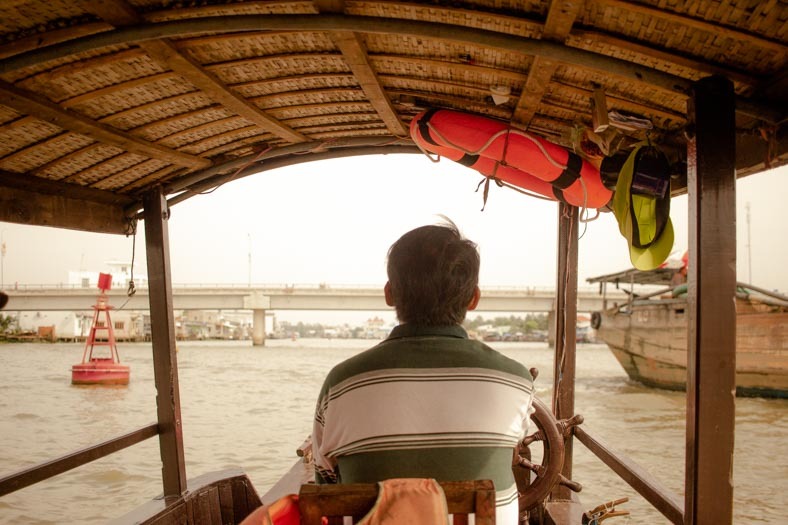 The Mekong Delta is a series of rivers that flow through southern Vietnam. The reason why this area is so popular? They’re home to the famous floating markets. If you want to visit, make sure to avoid the big tours (usually suggested via your hotel). Instead, book a tour with a local guide, who can give you a more genuine experience. Our Mekong Delta tour was with a local guide who lived in Cai Be (one of the towns along the Mekong Delta) who took us to his home for a home-cooked meal. 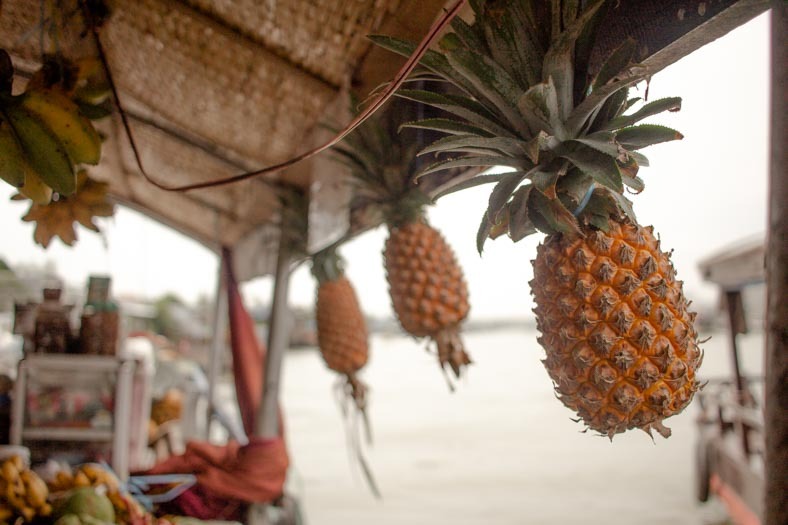 You can read about my experience visiting the floating markets of the Mekong Delta here! Sustainable travel has a reputation for offering costly eco accommodation options. In the past I’ve always thought to be environmentally friendly I’d have to spend a lot of money on luxury eco accommodation. Eco-friendly and sustainable accommodation options don’t need to break the bank. 4. Avoid big chain hotels and instead choose smaller, family-owned hotels or hostels. This means you’ll support the local industry and the money you pay for your stay reaches local residents. This was our hotel in Hoi An – it was a locally owned hotel where we felt like we were part of the family! 5. 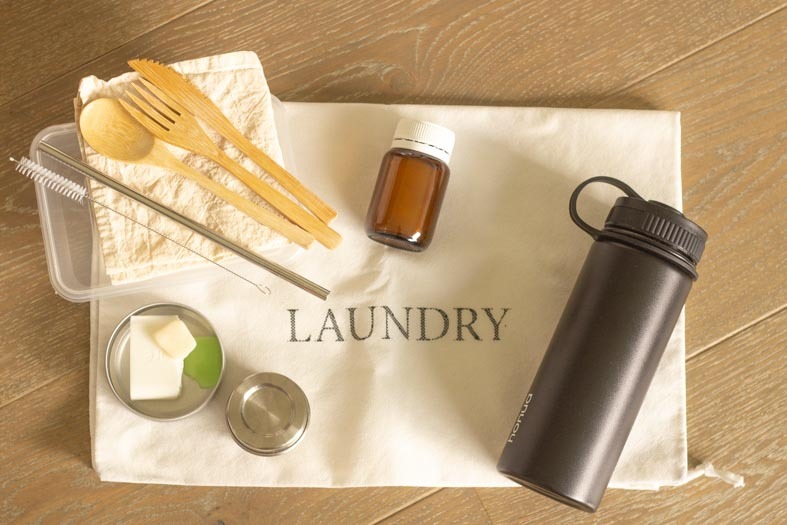 Try to pick hotels that offer zero waste friendly options like recycling or water fountains. I wish I had done more research into reviews when booking hotels. Plastic bottles made up such a big part of my waste when traveling. Many hotels in Vietnam offer bulk water filling stations or have water filters in their lobby. Our hotel in Hanoi had this, and it was helpful in avoiding plastic bottles. Homestays are also very popular and offer a unique experience that you wouldn’t get in a hotel. Sometimes homestays are linked to tours and offer you a unique and genuine way to see a place. 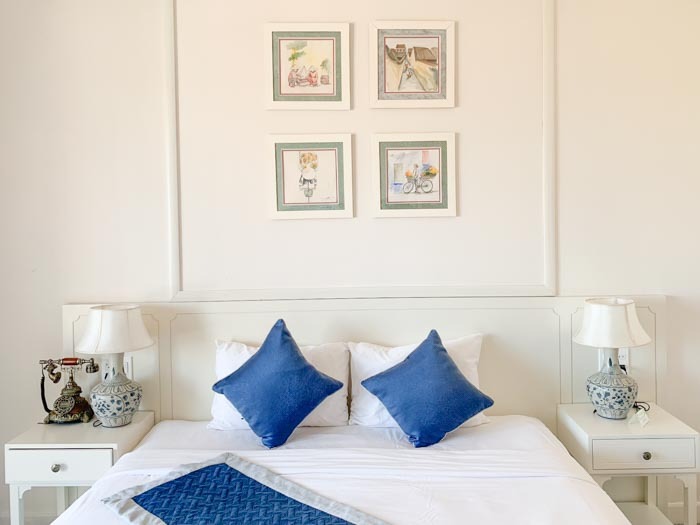 Our Mekong Delta tour had a homestay option – we wish we had researched before booking our Saigon hotel so we could have booked this! Food should be at the heart of every trip to Vietnam. I’m not going to lie – this was my favorite part of our trip! 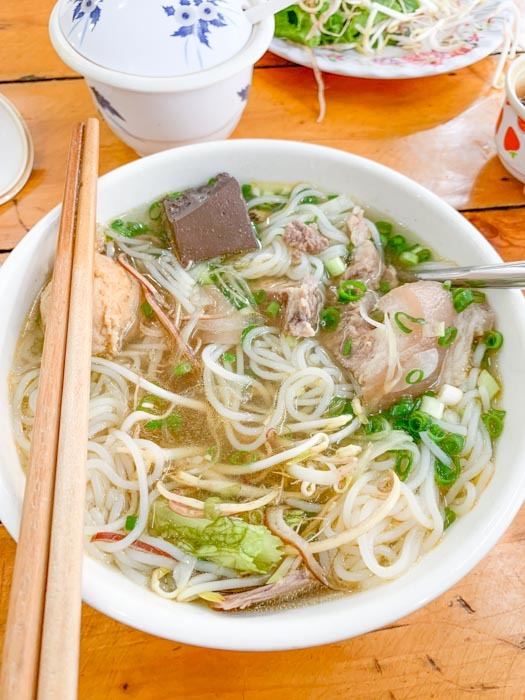 When traveling in Vietnam, make sure to stick to local food, rather than opt for western or international options. You’re more likely to support local families, farmers and reduce the distance your food had to travel! 7. Avoid single-use plastics when eating by opting to eat-in (instead of getting takeout). We never had any plastics served with our meals when eating in (aside from straws). If you need to get takeout, bring your own container and see if they’ll put your food in it, or if you’re ordering something like Banh Mi, these are usually wrapped in paper and put in a plastic bag. If you watch your server, you may be able to catch them before they put it in the plastic bag! While there are western and foreign foods available (like Mc Donalds etc. ), your best bet is to eat local food where you can. This way you’re more likely to support small businesses which are family owned, local farmers and reduce the distance your food had to travel. Bowl of bun bo hue for breakfast! Like most countries, Vietnam has a love affair with straws. My experiences with this were varied, especially given the language barrier. However, it’s worth trying, even to save a few straws from being used! Public transport does exist in these cities. However, I didn’t get a chance to experience it! Staying in areas close by to tourist attractions meant we didn’t need this. We walked to most of the tourist destinations, and when we couldn’t, we did take a Grab (local version of Uber) but made sure to plan, so we reduced this where possible. If you’re traveling between cities in Vietnam, the train is a reliable and a well-traveled route. Unfortunately, I had booked my trip before I was interested in traveling sustainably, so most of our travel was via plane. The next trip I plan will include more sustainable means of transport between cities! Souvenir shopping is an essential part of most trips – after all, who doesn’t want to bring home that special somethin’ somethin’ to remind them of their vacation? At a minimum, try to opt for items which have been made in Vietnam, and if possible under fair trade / ethical working conditions. While I’m all for packing minimally, it’s also important to do your research beforehand so that you don’t need to purchase duplicates of things you already have at home! For example, we knew we were traveling during wet season, so made sure to pack an umbrella. That way we didn’t need to buy the single use cheap ponchos that they always sell at tourist sites. Want more advice for packing for Vietnam? 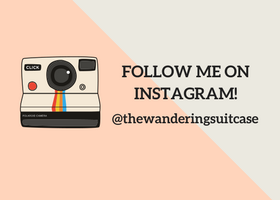 Check out my Vietnam packing guide here. 13. 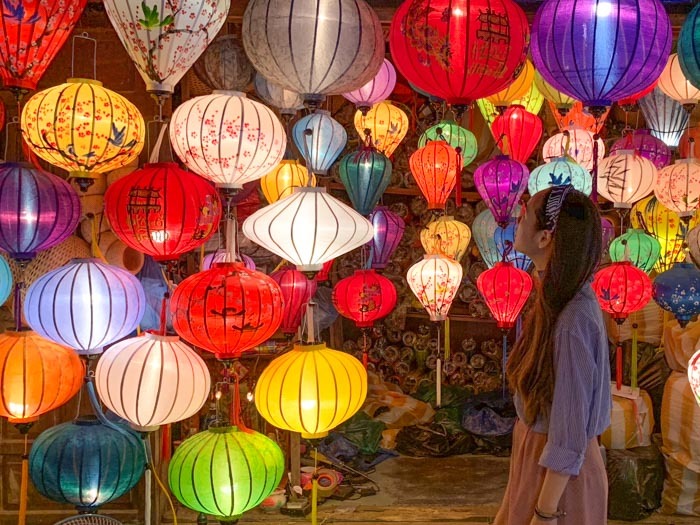 Haggling in Vietnam – should you? While no one likes to get ripped off, but when you’re haggling, it can be easy to get carried away. One moment you’re looking out for yourself, and next minute you’re haggling over 50 cents. The unfortunate reality is that amounts that are considered small for some foreign tourists can make a big difference in the lives of local Vietnamese. While you don’t want to get ripped off, small amounts can make a big difference to other people’s lives – keep this in mind when haggling! 14. Do you need to purchase souvenirs? Do you really need that shirt with watermelons on it? Will you actually wear it at home? But if you’re not sure – think about it, go for a walk, check out some other stores. You may find with time you realize you don’t need the purchase. 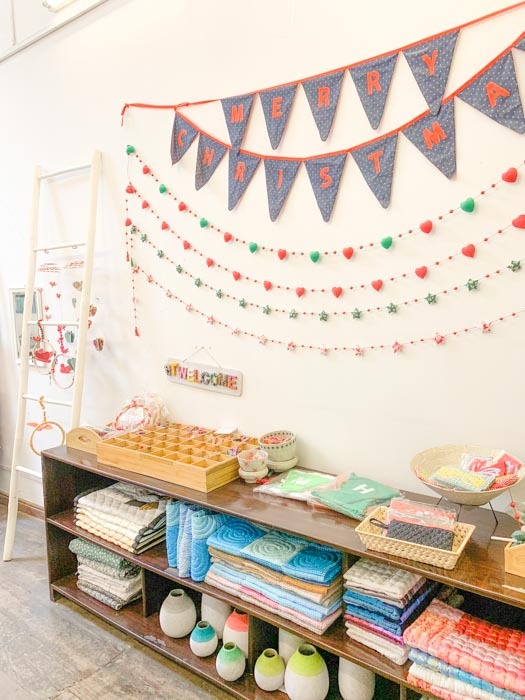 While not strictly zero waste, ethical shopping has a big impact on the local economy. Shop at companies that support local communities and treat their workers fairly. One of my favorite purchases from Vietnam was a skirt and top I bought from Metiseko, a company that makes clothing ethically in Vietnam from 100% organic cotton. 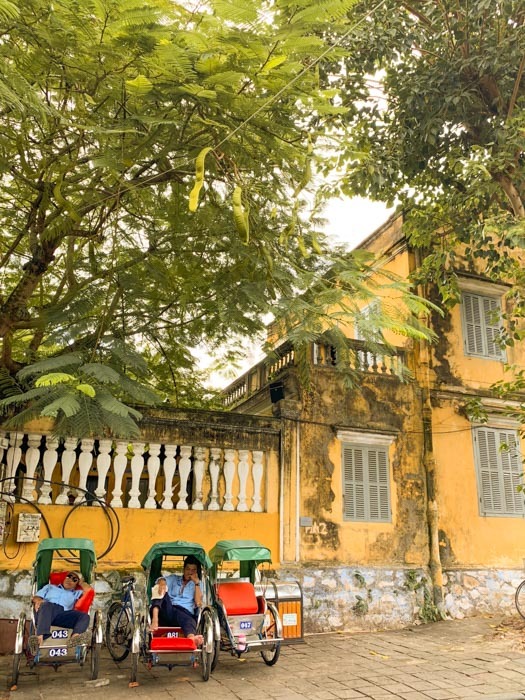 There are so many fair trade social enterprises in Vietnam – I’ll be putting together city guides for Hoi An, Hanoi, and Saigon where I’ll be sharing my favorite ethical shops in Vietnam! (1) Try to leave enough time for tailors to make your clothing. While tailors can finish items in 24hrs, your clothes will fit better the longer time you have and the more fittings you have. This will also ensure you’re not contributing to your tailor needing to work long, unsustainable hours. This not only ensures your tailor is paid well but also the age-old saying “you get what you pay for” applies here. Paying next to nothing for a tailored garment means shortcuts will be made. And there’s nothing worse than bringing home a poor quality garment! Many tailor shops (especially in Hoi An) will allow you to see the workshop where your clothes are made. Don’t be afraid to do this, and ask as many questions as you’d like. You want to make sure the workers are making your clothes under ethical and good working conditions! It’s relatively easy to get your clothes ethically tailor made in Vietnam. Side note: if you’ve had clothes tailor made in Vietnam, feel free to share your experiences in the comments for fellow readers! Avoiding bags is easy to do when in a shop – as soon as a bag is pulled out (whether it’s plastic or paper), you can say no immediately. We never had an issue with this, and you’re saving them money (even if it’s a small amount) by not consuming something you don’t need! Everyone has different preferences when it comes to zero waste or sustainable travel. At the end of the day, your health is one of the most important things to your life. Our lives are drastically impacted when we are in poor health, and this can stop us from living our everyday lives. Sometimes being unwell can result in a greater impact on the environment (unfortunately pharmaceutical products are not great for the environment!). Based on this, I think it’s so important to do everything within our power to make sure we are healthy. Vietnam is still a developing country, which means there are various food-borne illnesses you are at risk of when visiting. Make sure to visit your doctor a few weeks before you travel (I like to book in the appointment a month prior) to make sure you get all the vaccinations you need. Unlike in many western countries like the US, UK or Australia, tap water is not necessarily clean or safe to drink from. There are various filtering or UV cleaning systems that exist where you can make your water safer to drink. After consulting with my doctor, I decided that such systems weren’t right for me. Instead, I filled my water bottle from bulk drinking water systems or bought larger bottles of water. While this is not strictly zero waste, I have a history of getting ill when traveling. Being sick is more non-zero waste than the odd drink bottle. I know this is not a popular opinion to have, but like all things health-related – is a personal decision based on my own health. Mosquito-borne diseases are a risk for all travelers to Vietnam. While Malaria is not as common unless you’re in rural areas, Dengue fever is a risk. Make sure you use plenty of insect repellent – because contracting dengue is far more detrimental to the environment than a few sprays of insect repellant. Like all things health-related, make sure you make a decision that is based on your circumstances and what works for you. Personally, I use a mosquito repellant that does not contain DEET. However, this is based on what works for me. I would recommend you to make a decision based on what works for you and your health! Note: DEET is a bit of a controversial ingredient in insect repellant. There are mixed studies – some of which shows that DEET has no negative effect on human health, but others which show the opposite. Additionally, some studies show that DEET can be toxic to animals and the marine environment. Wearing sunscreen is especially important if you’re spending time outside or by the beach in Vietnam. While the packaging that sunscreen comes in isn’t always environmentally friendly, protecting our skin is key to long-term health. Choose a sunscreen that is reef safe, as most traditional sunscreens contain ingredients which result in the bleaching and death of coral reefs in the ocean. I’ll be putting together a guide soon on how to choose an environmentally friendly sunscreen! 22. Don’t be afraid to say “no” things you don’t need. On our overnight ha long bay cruise, I was given a gift of a shell (it was my birthday!) while I don’t support taking shells from beaches, I’m also not able to take shells into Australia due to customs restrictions. I gave back the gift and explained it would be destroyed if I took it with me. This is something I write with very mixed feelings about – after all, you want to support kids, right? Unfortunately, we don’t know the backstory to children who work – will the money go directly to their families? Does it go to a third party (code word for dodgy!) before it gets to their families? Purchasing from children who work perpetuates an ongoing cycle where they don’t attend school and work instead. There are several travel experiences that involve using captive animals to work for tourist photographs. For example, we were researching day tours to the Mekong River, only to come across a review about the tour including a ride on water buffalo who looked starved and abused. Mistreating animals and using them for human entertainment is, unfortunately, a practice which still exists. When you’re booking tours, make sure you read reviews to make sure your experience doesn’t support or involve the mistreatment of animals. Vietnam is a developing nation, so child labor is not all that uncommon. It’s estimated that 9.6 % of the population under 18 in Vietnam (that’s 1.75 million Vietnamese children!) are child laborers. Clothing made by many fast fashion brands are made in Vietnam and thus by child laborers. You can continue to be a responsible “traveler” when you’re no longer in Vietnam by voting with your wallet. Avoid buying from these companies that support poor working conditions and child labor. Instead, support fashion companies which result in good working conditions for garment workers. One of my favorite ethical Vietnamese brands is Metiseko, which not only uses 100% organic cotton but also pays workers fair wages, provides good working conditions and free healthcare. 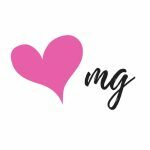 Note: for all my fashion loving readers out there I’d love your suggestions for ethical clothing brands which employ Vietnamese garment workers. Leave me a comment with your favorites! Even if you aren’t an avid zero-waster or you’ve never thought about traveling responsibly before, being a responsible traveler isn’t hard work. You don’t need to spend a bucket load on luxury eco-friendly resorts to make a positive impact on the world. Small, well-researched decisions can support local communities and make such a difference! 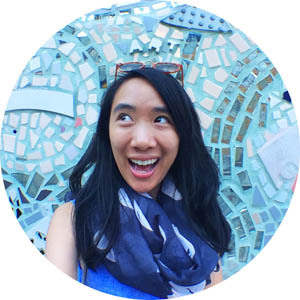 Now, I’d love to hear from you – are you traveling to Vietnam? What steps are you taking to be a responsible traveler? Being a responsible traveler can be so difficult sometimes. It’s so great to see more and more posts like this one encouraging change! Bravo.